I’m beginning to think I’ve missed the heyday of custom ordering automobiles. No longer can you go to your local dealer and tick boxes for absurd options that included special engines or go-fast bits from race cars – or, insanely, the type of metal your car is made out of. Most of Mercedes-Benz’s legendary 300SLs were steel-bodied cars, save for the aluminium hood, doors and trunk lid. Only 29 of them were “Alloy” bodied cars, that is, aluminium all the way around. The cost for this special option was very high and the weight savings around 175 lbs. These cars were intended for privateer racing teams and were available beginning in 1955, the same year Mercedes-Benz withdrew from competitive motorsport. Other sporting changes made to the Alloy cars included suspension upgrades and those awesome Rudge knock-off wheels. There was also a “special” engine available (to all Gullwings, according to Mercedes) that used a competition camshaft, adding 15 horsepower. This car has that as well, so it’s 3.0-liter straight six makes 215 horsepower. This is car #21 of the 29 built and its ownership history is known from new. An Alloy 300SL is the most desirable version of an already must-have classic (not counting any of the earlier racing versions). This one has no stories and would be a joy to own – and maybe even flog a little on the backroads. I just hope that the new owner is into that sort of thing, and not into storing this in a bunker somewhere, waiting for prices to rise so they can turn around and cash in. Gooding & Company sold one of these earlier this year for over $4 million. This should do likewise. You can read more here and check out more from RM in London here. 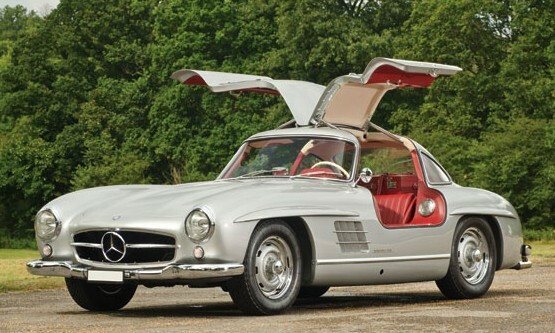 This entry was posted in Uncategorized and tagged 1955, 300sl, alloy, auctions, cars, classic cars, gullwing, mercedes-benz, rm auctions by classiccarweekly. Bookmark the permalink.